Add incredible chopping power to your kitchen with this amazing tool. The Salsa Express Miracle Chopper can make salsa, chop onions, prepare salads, dice tomatoes, separate eggs and so much more. 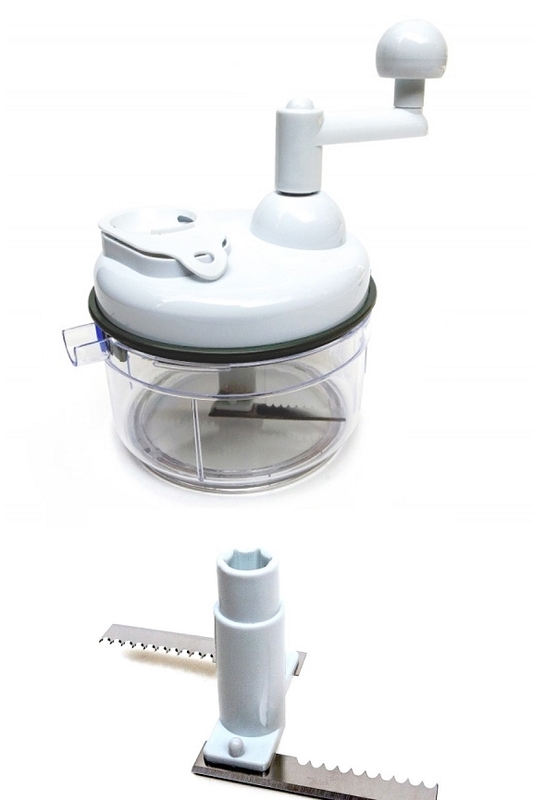 It is a manual food processor, so it doesn't need electricity, but it will offer similar speed and results when compared to those expensive alternatives. With just a slight turn of the handle, you will be able to chop, mix or beat faster than ever, and the effortless operation will result in food that is cut 20 times faster than you could with a knife. A two part blade spins around with each rotation, so for every turn, you will be chopping several times, and in multiple locations. Each blade is also double sided, so you can cut in both directions for maximum power. Either way you turn it will result in chopping, so give it a couple twists one way, and then spin it back in the other direction for a quick and even cut. It can help you make homemade salsa for your next party, chop onions without crying, or even meatloaf for dinner. Prefer a chopper with three spinning blades? Not sure what you prefer? Upgrade the standard package by adding one of our replacement blades at a reduced price. Choose from the samurai style or serrated style, and it will be included as an additional blade to the one that comes standard. Both are made from high quality stainless steel, and both have razor sharp edges mounted in three locations. The serrated blades are identical to the standard ones, but there are three instead of two. The samurai version is only sharp on one side, but it has a curving design that some people prefer. Multiple Uses. Chop, dice, mix, blend, and more. This compact tool can replace several others, and prevent you from wasting time and effort when doing things by hand. Double Sided Blades. Two blades are perfectly positioned, and each has a serrated edge on one side, and a scalpel edge on the other. Turning the crank at the top operates the blades, and significantly increases your cutting speed and power. Contained. Smells, food chunks, liquids and everything else stay inside as you work. This reduces messes, increases speed, and allows you to prepare food without enduring pungent odors. Easy To Store. Thew compact size, and nesting parts allows this powerful tool to slip easily into any cupboard in your kitchen. Simple. Just spin to chop. Anyone can produce perfect results quickly and easily. There is no skill involved, no strength required, and no complicated steps to learn. Non-Electric. A great alternative to bulky and expensive machines that need to be plugged in, this gadget is equally suited for occasional use, or everyday food prep. Easy Maintenance. Cleaning other food processors can be a real pain. This one comes apart easily, so you can quickly hand wash and dry by hand or air. Looking for something less expensive? Want something that does even more?This is a pretty basic chopper, but if you want to spend a little bit less, check out the Manual Food Processor. It is very similar, but it does not have a pouring spout, and the blade is slightly different. For something with more attachments, check out the Ultra Chef Express or the The Kitchen Plus. Chop and mix your food all at once. It's awesome for saving time and frustration when dicing a single vegetable, but it becomes even more amazing when you use it to full ability. The possibilities are nearly endless with this machine. Chop onions without crying, create a signature salsa and so much more. The completely enclosed design contains smells, and prevents messes because everything remains inside instead of on your hands, in your eyes, or all over the counter. Check out the list of things it can do below, but use for other similar tasks as well. Perfect for fruit, vegetables, meats and more. This tool will dice, blend or mix anything you put inside. The metal blade has a double blade design, so each rotation allows you to cut at multiple levels and locations. Prepare gourmet recipes, mix together ingredients as you cut them, chop onions without tears, or create your own salsa from scratch. The integrated egg separator simplifies preparation of meringues and custards, and makes it easy to cook with egg whites. Your food will be chopped much faster than by hand, and there is very little mess in comparison. All of the odors and small pieces will be contained within the unit so your counter top will stay clean, and pungent vegetables won't affect you. Add multiple ingredients at the same time to chop and mix all at once. To prepare for use, install the blade at the bottom of the bowl. Add in your ingredients. It can be a single veggie, or multiple ingredients that you will chop and mix together. If using larger foods, halve or quarter before adding for best results. Place the lid on top, and secure in place by turning clockwise. Attach the turn handle by firmly pressing it into position on the top of the lid. To chop, place one hand on the crank at the top, and the other on the lid, over the egg separator. Simply turn the handle to chop. The faster you turn, the quicker the results. This model has a double blade with serrated edge on one side, and a scalpel blade on the other side. No matter which way you turn, chopping will occur. For maximum power, make a slight turn to the left prior to turning clockwise. Use the pouring spout to pour out liquids or serve dressings. To use the egg separator, crack your egg on the bridge portion. Let the egg flow in, and shake back and forth to ensure everything is inside. The yolk will remain at the top, and the whites will fall inside the bowl. With the removable part off, you can also use the egg separator part to add liquids as you chop. This tool makes cumbersome electric processors a thing of the past by giving you the same power and results at a fraction of the cost. Most people don't need a fancy machine for the amount they will use it, and this one will produce similar results at a much lower price, and it is incredibly simple to use, and easy to clean. There is no electricity involved in operating this gourmet food chopper either. That means increased safety, simplicity and portability. Cleanup is simple too. Just open the top and rinse clean, or place it in the dishwasher on the top rack for washing. The compact design allows for easy storage, and because all pieces nest within each other, it will fit conveniently in a cupboard when not in use. Stop wasting energy with lower quality imitations, and don't go for an expensive model when its not necessary. This versatile tool will chop cabbage for coleslaw, dice potatoes for hash browns, cut onions and celery for macaroni or potato salad and so much more. Use it for pancakes, pastries, sauces, batters, and all sorts of other stuff. With its collection of convenient attachments, the Miracle Chopper makes cooking and baking easy for even the most inexperienced cook. Buy it to make salsa at home, and discover the endless number of ways this great chopper can save you time and make food preparation easy. Dimensions 9" x 9" x 11"
Dishwasher Safe No. Hand washing recommended. Make your own salsa, and so much more. Toss food inside and turn the handle to chop and mix faster than ever. You will be amazed by the professional results and easy operation. Order Yours Today! The product is as good as expected. I actually bought 2 of them. It was shipped within a reasonable amount of time. I am completely satisfied with my purchase. Very easy to use and does a great job mixing & chopping pretty much anything put into it! This chopper works exactly as advertised. I love it!! I have been using these simple economical salsa makers for years. I love them and so does everyone else! Great gift for any occasion. Easy to operate and clean - what else can you ask for! I am very pleased that you had the replacement part I needed cut I have had my old one for many many years and I love it. Thank you very much. You guys are great. I have really enjoyed using my new Salsa Express Miracle Chopper. It is amazing how fast it cuts up onions and tomatoes and avacados for Salsa! This chopper works great. It chops all the veggies in just a few turns. I'm planning on buying one for my son we like it so much. The salsa chopper I ordered from Simplygoodstuff.com is amazing. It chops the salsa ingredients to the perfect size. Overall I am pleased. Does a good job of chopping veggies and making salsa. This is the third one I've bought over the years and love it. This is the greatest salsa/onion chopper we have ever used. And priced right too! Bought one many years ago and use it at every cook out that needs onions chopped. Make salsa too, as well as blends when that feature is needed. This is a great tool that every kitchen should have. Care needs to be fore most when cleaning. The sharp blades cut! I had the original version years ago so my expectations were high and my standard of measure. With my old one, a couple turns of the wheel with a quartered tomato, onion, cilantro, and presto. I had a difficult time getting mushy stewed tomatoes to even break up with the new one. The old one came with a cap to put on the spout to prevent leaks. I had tomato juice dripping and shooting out every where with the new one. The old one had a nice side handle for leverage turning the top. The new one, clumsy. The old one I used for everything on a daily basis...onions, tuna fish salad, celery, garlic, egg salad, salsa, etc. the new one lives in the closet. The blades are extremely sharp and in theory this little gem should work. I will continue to try more items and cover the spout with tin foil. I miss my old one ( daughter has it ). The Salsa Miracle Chopper is one of the most used tool in my kitchen. I have chopped every kind of vegetable imaginable plus used it to quickly blend tuna, chicken and egg salads. Clean up is a breeze, everything on the top rack of the dishwasher. There's no electric buzzing or the pounding sound of other hand choppers. Best of all you can rough chop with it or continue turning the handle for almost a grated consistency. Love it so much I bought one for my son & daughter. I have used these choppers for many years, I found them on QVC and ordered several , they wore out and I paniced ,as Home shopping don't sell them any more, so I looked online and found the Miracle chopper, it cost a little more and I was going to buy several but am hoping Home shopping will bring them back at a good price again soon, as these are really good & I want to stock up on them . Thanks for sending , I would order these anytime as they really work. Love this ha dy little machine. However, I used it to chop oreo cookies and broke one tooth on one of the internal sprockets. Wish I could order replacement sprockets. we are very pleased with our miracle chopper. it does about any thing we want it too. Sorry, haven't had a chance to use it yet (life has been busy), but it was a replacement for the same item I have had before and loved - so simple to operate, and it does a great job. Miracle Chopper - all I expected and more! My sister in law told me about this chopper and I decided to purchase it. It works great - I would recommend it to anyone who wants something that works well with easy clean-up! This chopper is the best invention since, well, chopped vegetables! It is fast and easy and works perfectly. Cleanup is a breeze. Love this machine! This chopper used to make salsa is a complete flop. It chops some foods and purees others. I just threw away the $17 I paid for it. simplygoodstuff response: We do not have any orders from you, and we do not charge that much for this product. We are sorry to hear that you paid more for an inferior product, but if you had actually gotten it from us, you would be quite happy. If a product ordered from us worked as you describe, we would certainly make things right. Thank you for bringing this to everyone's attention though. There are all kinds of similar looking choppers out there, and many are quite inferior. If you chose the one featured here, you can be sure it will function as intended. This is a great chopper. I had one for about ten years, I used it to chop everything. I lost one of the pieces. I was so glad to find another one. ... I bought one of these at a fair several years ago, and used it a lot, but the blade got lost in a move so I bought this one. It seems to be better,(has more parts) and cost less than the original. I bought two of the Miracle choppers. I have had one previously and I got the bowl too close to the heat. :( I make smoothies, chop onions and I'm thinking about churning cream into butter. I have not tried that yet but I don't see why it wouldn't work. This product replaces several appliances. And for off-the-grid it is ideal. You can't beat it for the price. It's just what I was looking for.It works great and does the chopping fine enough to put in my cooking and unless you see what veggies I chopped you couldn't find in the finished product. A neighbor made his own salsa for years, however did not know where he got his chopper, I looked all over no name on it, nothing like it in stores and I kept going back to try google. And after about three tries you popped up. I ordered 5 one for neighbor, 3 for my kids and 1 for myself. Unbelievable, I made salsa last night it took 10 minutes. I love it. I think you should charge alot more, make a little stronger and you would make a killing on this item. love it. My mom bought her first CHOPPER when it was called SALSA MASTER. Another name for it is Quick CHOPPER. She loved it so much she bought 4 more. 1 for each of us kids. We all use it a lot. Mom has even bought a deeper base for hers. We LOVE it. Where can we find replacement parts for ours? Like the plastic plate inside that helps pull the food out once it's chopped, or another base, the hand crank. ETC. I have a miracle chopper and in a recent move, lost the hand crank. How can I obtain a replacement? Although it is not available as a standard replacement part, we may have one or more available in our warehouse. Please give us a call to check current availability, and place your order. Hi, I need to see if I can get replacement blades? You sure can. Please give us a call, and someone would be happy to help you order one. Most people reviewing this are chopping veggies...I'm wanting to make baby food from regular cooked foods, including meats...will this work for that purpose or does it require things that are softer to start with? It can chop just about anything, soft or hard, and you can cut it down to any consistency you prefer. It is certainly not just for veggies. Where is his product manufactured? where can I get a new manual/recipe book for the salsa maker? Give us a call. We would be happy to help you out. I recently purchased the absolutely wonderful Ultra Chef Express. Is it possible to buy accessories for it that it didn't include but are available in similar products? Like the salad spinner. And some have a shredder AND a grater as two separate devices. Any help you could give me would be greatly appreciated. We usually have these parts available in our warehouse. Please give us a call to order one or more of them as you will not find them listed online. ?Where do you get a replacement bowl, my teen broke ours? Give us a call. We would be happy to check inventory for you, and sell you one if we have any available.